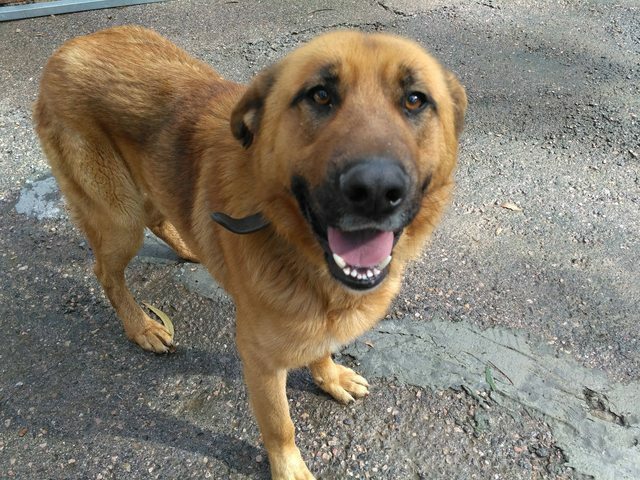 Emiliano is an 18 month old male German Shepherd cross Mastiff. 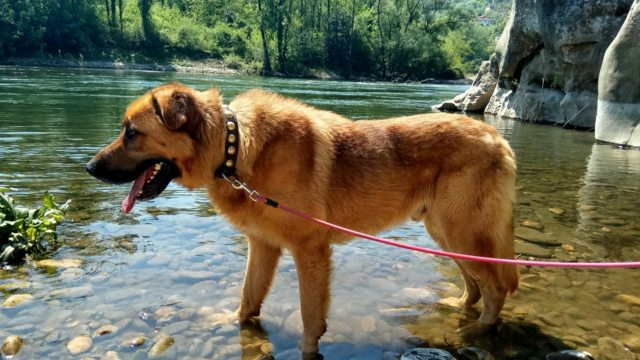 Emiliano is an amazing and handsome tan German Shepherd Dog – Spanish Mastiff mix, with the best traits of both breeds: noble, obedient, intelligent, loyal… he stands at 63 cms tall and weighs 45 kgs. Emiliano just wants to go for a walk and be next to someone who will give him some cuddles. He is affectionate with every person he meets and he loves playing with every dog at the park, he’s very sociable. A big gentle giant with a lot of love to give the right family. Loves cuddles. Always a warm welcome when you come home. Everyone who meets him falls in love with him (especially the dog trainer!). He is quite calm when he is not playing, despite his age, he’s not nervous at all. He has a very obedient nature. He behaves very well in walks and is calm with children. Poor boy used to growl at other dogs for food when he arrived at the shelter, which is very common, but he’s been trained not to do so and now he can enjoy treats with other dogs and he’s calm. He is healthy. 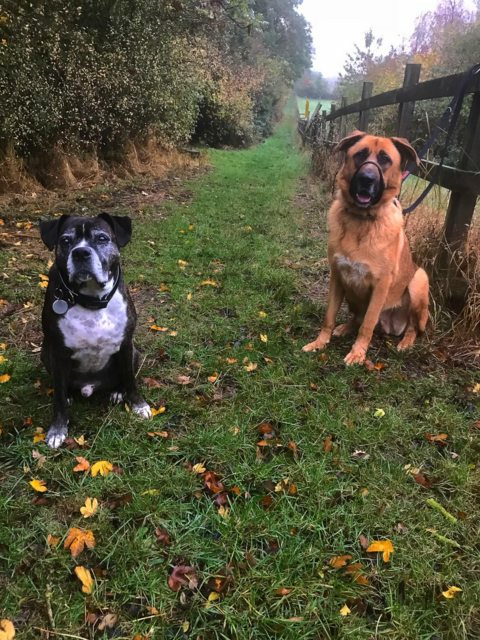 He in now in foster in the UK and a reoccurring ear infection he had in the damp shelter seems to have cleared up in foster as we thought it would do. He was so good he let the vet check his ears and didn’t even move. Foster Report: Has shown no aggression towards humans or dogs. Has a puppy like personality and wants to play. Loves his food but has always been fed separately to Charlie, the other dog at his foster home. He loves Charlie and is desperate to play with him. Greets dogs well when out walking. Has been walking a minimum 90 minutes a day and happy to sleep at our feet while we work throughout the day. Has shown signs of obvious abuse in the past. Dropped to the floor when I picked up the broom, scared of the window cleaner with long cleaning tool and very wary of anyone with a walking stick, etc. Sudden noises make him jump but is acclimatising well to all the new sights and sounds in and out of the home. We are currently halti training him on walks which is going well, he doesn’t pull anymore. He’s also been to doggie training school for a session which went really well. He now understands commands sit and stay. He will also do this for his food. He is super gentle when taking food from your hand. He understands ‘have a wee’. Only had 2 wee wee accidents in the home but that was our fault as didn’t read the signs correctly. As long as he wees as soon as hes up and after meals and last thing at night, all is okay. He is crate trained and happy to sleep in there. He has been left crated while we’ve been out for approximately 2 hours and was totally fine. Night times he comes to bed with us and sleeps on his bed through the night. Emiliano has a very strong hunting (and hurding) instinct. He has even remembered which field the cows are in and when we are out he looks for them. He most definitely cannot live with cats, birds and other small furries. 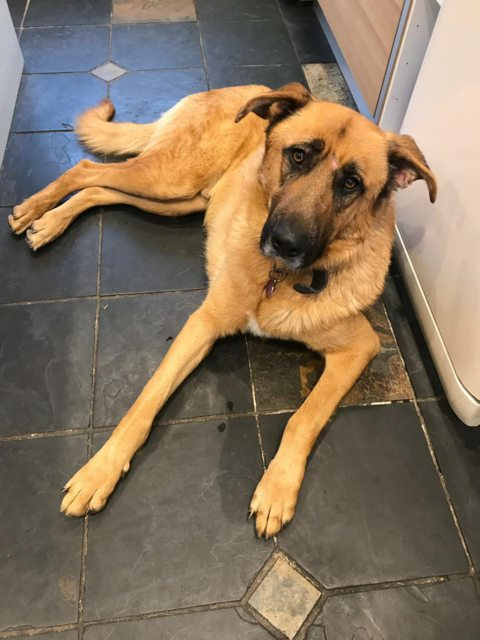 We would also recommend he is not homed with very small dogs because he loves to play and for that reason he’d enjoy more playing with a dog of his size, although there’s been no aggression shown towards small dogs. He has no idea how big he is (and often bumps into furniture!). 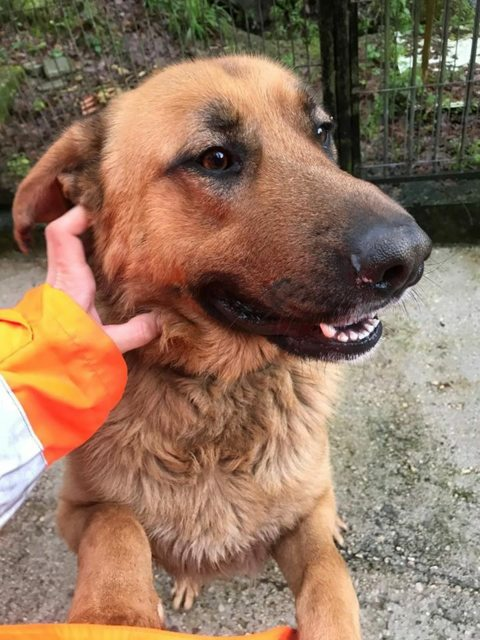 This beautiful boy deserves the right home. He can be taken anywhere in the UK. Current location is in a foster home. Vaccinated, wormed, flea treated, Neutered, Microchipped, Pet Passport. FREE 4 weeks Pet Insurance to be activated from the link on our website, Any known health issues -Ear infection.